TEMPE, Ariz., October 21, 2009 – Flow Technology, Inc. (FTI), a leading manufacturer of precision flow measurement instruments, systems and calibrators, today announced the FT-LD (Leakage Detection) turbine flowmeter system. 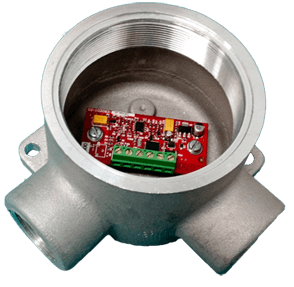 This advanced solution offers significant improvements in flow measurement accuracy under dynamic temperature conditions. The FT-LD system provides inferred mass measurements for leakage detection by correcting for temperature effects on fluid volume. Today’s industrial companies must ensure the ruggedness and reliability of every component used in their products. For example, manufacturers of off-road equipment employ automated test stands to test torque converters for leakage prior to assembly in tractors, bulldozer, backhoes, etc. Transmission oil is measured before entering the torque converter and again after exiting. Any difference in the flow rate can be attributed to leakage in the device. This testing is complicated by the fact that fluid volume at cool temperature is not the same as at high temperatures. Employing Flow Technology’s FT Series turbine flowmeter paired with the LinearLink™ Temperature Compensated Interface (TCI), the FT-LD system helps users obtain precise leakage measurements for fluids such as engine oil, transmission oil and hydraulic fluid. The FT Series meter is an ideal choice when high accuracy, compact size and fast response are critical. The LinearLink TCI is a sophisticated electronics platform for flowmeter linearization, viscosity correction and density compensation. For leakage measurement, FT Series turbine flowmeters are installed in series on a test stand fixture with the inlet meter located downstream of the device-under-test (DUT) and the outlet meter positioned upstream of the device. The system is then pressurized with the application fluid and the DUT is run through pre-programmed tests to evaluate its overall performance. The LinearLink TCI infers mass by density compensation, essentially bringing the cold and hot fluid volumes to a standard. Regardless of the fluid temperature, the compensated volume of flow is converted to a weight equivalent—allowing the user to determine the amount of leakage that has occurred during a test procedure. Fluid leakage rates are calculated by subtracting the outlet mass flow rate from the inlet mass flow rate. For more information about the FT-LD system, please visit https://ftimeters.com.